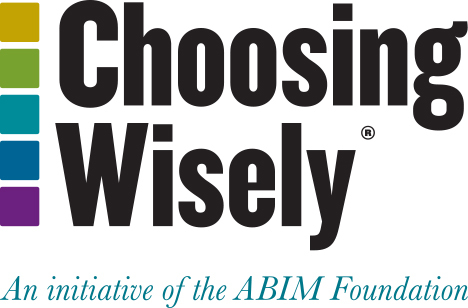 The Choosing Wisely Champions program is an opportunity for specialty societies to recognize their members for their work in reducing overuse. Since the spring, four societies—the American Geriatrics Society, the American Society for Clinical Pathology, the American Society of Nuclear Cardiology and the American Society of Hematology—have named winners. In May, the American Geriatrics Society (AGS) recognized Alina Sibley, APRN, BC for patient outreach and peer training at Baystate Medical Center in Massachusetts. Under her leadership, Baystate’s Geri-Pal team has served over 500 patients in the community through home visits, consultative ambulatory care, patient and family education, and care coordination. The team also facilitated training for nurses and other Baystate staff to help reduce the use of restraints, antipsychotics and benzodiazepines—a critical priority from the AGS Choosing Wisely recommendations—in its Acute Care For Elders program. 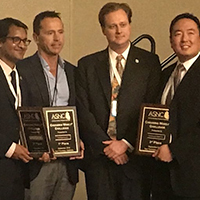 The American Society of Nuclear Cardiology announced its Champions at its annual meeting in September, naming three winning teams. Ila Singh, MD, PhD at Baylor College of Medicine & Texas Children’s Hospital in Houston for her involvement in creating the Clinical and Laboratory Standards Institute (CLSI) document on test utilization, and her membership on the national committee on Lab Test Utilization and Stewardship that co-authored the consensus document on the subject. Curtis A. Hanson, MD at Mayo Clinic in Rochester, MN, for leading the incorporation of laboratory utilization rules into the inpatient hospital practice and Mayo’s clinical decision support tool. A group led by Diane George, DO at Henry Ford Medical Group in Detroit, MI, for establishing a baseline of ordering volume and developing an analytics tool to monitor total volume, as well as highlight low and high utilizers. Within the first year of implementation, the number of Vitamin D orders decreased from 685 per month to 150 per month, and the number continues to decrease at an annual rate of 23 percent. James Littlejohn, MD, PhD of Weill Cornell Medical Center, NYC, for evaluating data pulled from the operating room’s electronic medical record and working with a team to produce an intuitive user interface for the perioperative transfusion dashboard. The team then strategized the best approach to begin a perioperative blood management campaign, and produced and administered a survey on perioperative red blood cell transfusions. Heather Signorelli, DO at HCA-HealthOne, Denver, CO, for creating laboratory stewardship programs for two hospital markets that led to an annual savings of over $2 million. Adam Binder, MD and his colleagues at Montefiore Medical Center developed a process improvement initiative to increase the appropriate use of vancomycin for neutropenic fever over a 10-month period. This initiative led to a 17 percent increase in appropriate prescribing. Ming Lim, MD at the Medical University of South Carolina helped implement a centralized hospital-wide protocol that coordinated testing and treatment of patients suspected to have heparin-induced thrombocytopenia (HIT), which led to improved testing and management of these patients and substantial reduction in the use of direct thrombin inhibitors. Prakash Vishnu, MD and his team at Mayo Clinic in Jacksonville, FL, designed and set up an electronic medical record-based restrictive RBCt program as part of a quality initiative at Mayo Clinic’s hematopoietic stem cell therapy center. Clinicians, hematology trainees and nurses were educated about this program with weekly didactic sessions, pamphlets, and verbal instruction for two months. The intervention ultimately led to a significant decrease in transfusions and an estimated cost reduction of over $22,000.